I hate breakfast. Well, I probably shouldn't put it exactly that way. I just have this weird thing about not wanting to chew that early in the morning. I am fine at about 9:30-10:00 am, but honestly, it just doesn't work to wait that long to eat. If I have pancakes, or waffles, or an omelet, I want them for lunch or dinner. I basically just want to drink my breakfast. I used to always have a Carnation Instant Breakfast drink, but I have been slowly trying to clean up my eating, and while that is fine occasionally, I have decided that having a smoothie in the morning is really ideal. Unfortunately, it took me a really long time to hone my smoothie making technique, mostly because everyone has a different opinion on what a smoothie should be.I had to play around with fresh and frozen fruit, amounts of liquids, and blending times and techniques. 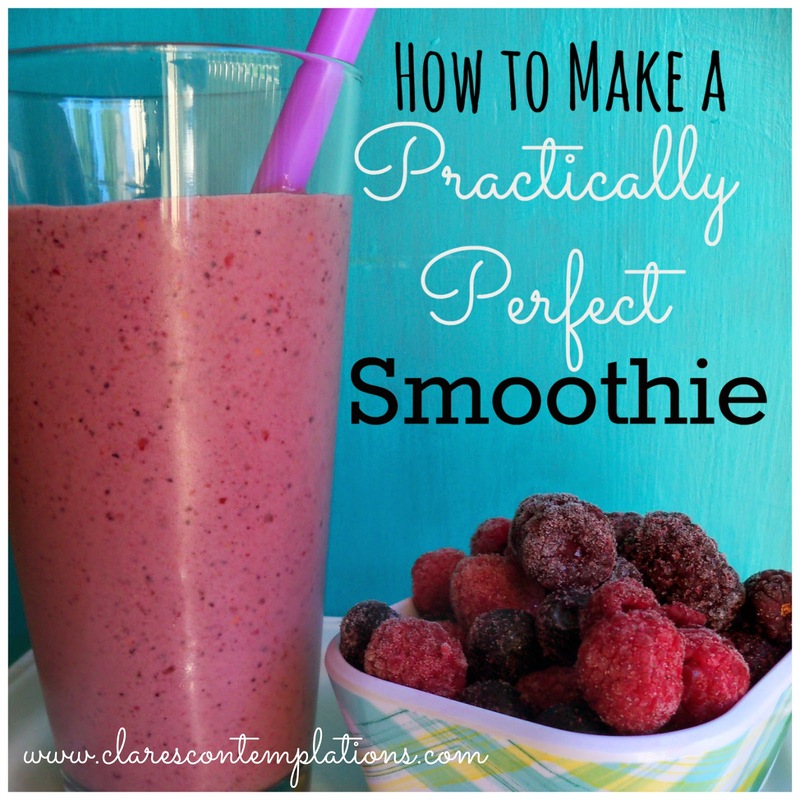 So, this isn't so much a recipe, as a how-to fine tune your smoothie to make it perfect for you! I wanted a smoothie that was really cold, but I hated adding ice, which a lot of smoothie recipes recommend. It takes me a while to drink the whole thing, and I didn't like that it would get watered down. I also didn't like the little ice chunks. So that is why you need to use frozen fruit. You can freeze any type of berry, cherry or melon that you want! I love to buy the triple berry blend from Costco, and also frozen pineapple. You can use any combination that you like. 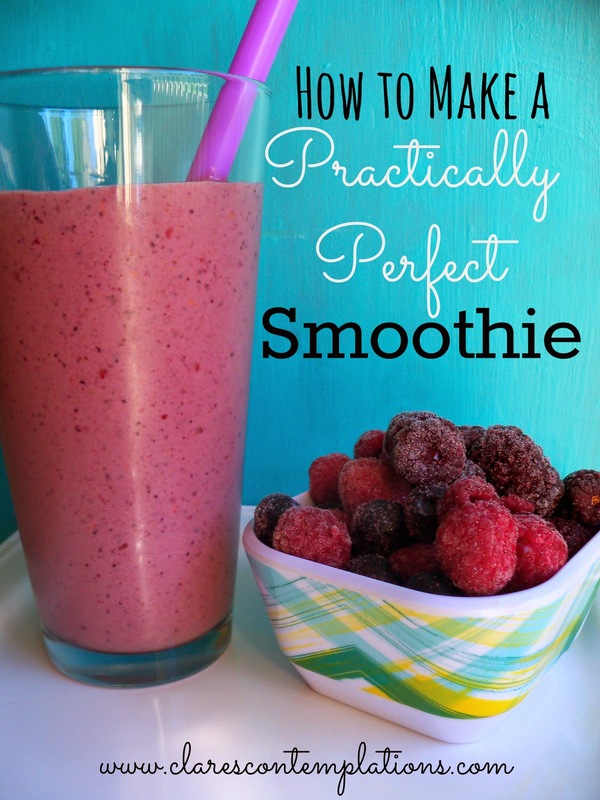 Using frozen fruit makes for a really thick smoothie. I don't have a high-powered blender (Someday, I would love to!) but the Oster I have works just fine, as long as I am careful with it. I add my fresh banana first, then the fruit. After that, milk, yogurt, spinach. I turn it on high liquefy. I watch to see if it is mixing-if not, lift the frozen fruit up-*away* from the blades. This allows the machine to draw the fruit in from a different angle. It sounds kind of technical, but I was just wished that someone had told me that it doesn't work as well to try to shove the fruit onto the blades! I let it blend for about 30 seconds, re-arrange with a spatula, and then blend again. When everything is evenly colored, there are no visible chunks and it is pulling down in the center it is done. One of the most important things to know is: if you want a thinner smoothie that isn't as cold, use more fresh fruit (say, 1/2 c. fresh berries, 1/2 c frozen berries). If you want a thinner, cold smoothie add more liquid. You can swap out the milk for anything, occasionally I will add half milk and half orange juice, but you could use all juice. I don't like my smoothies to be super sweet, either. However, sometimes I will use Tillamook Vanilla Bean Greek yogurt-that stuff is amazing! You can use regular yogurt instead of Greek, but you will be sacrificing a lot of protein. And honestly, you won't be able to tell the difference! Once it is all blended together, it is liquid anyway. If you are having problems with your spinach not being completely blended in, try blending it with just the milk before you add anything else. Once your milk is smooth and green you are good to go! If you are tasting the spinach, just decrease the amount initially. I have never really had a problem with it. I have never tried adding kale, I have heard that is a little stronger. I just figure that if I don't notice the spinach it is a great way to get some veggies first thing in the morning! I also love that it is easy to freeze berries that are past their prime for eating, and they still taste great in smoothies. Strawberries, raspberries, blackberries-they are so delicate! Once they are headed downhill, I just wash them, lay them out on a tray, freeze them for 30 minutes to an hour and then put them in labeled ziplocs. Don't skip this "flash-freezing" step, or you will end up with a giant lump of berries that you can't measure. And it will be beastly to blend! I have seen where you can freeze your ingredients in individual baggies so that you just have to dump it all in, but I haven't found that to be especially time saving for me, and it also prevents me from being spontaneous with my fruit combinations. I usually have a least two or three different types and I like to mix up the quantities. You can also use frozen bananas in place of fresh, I usually cut mine into 1 inch chunks before freezing. That will make your smoothie really thick! I love to use a fat smoothie straw, my sister gave me these great reusable ones. Be warned though: freezing your bananas seems to intensify the banana flavor, and if your banana is overripe it will taste even more that way. Just use those bananas for baking! 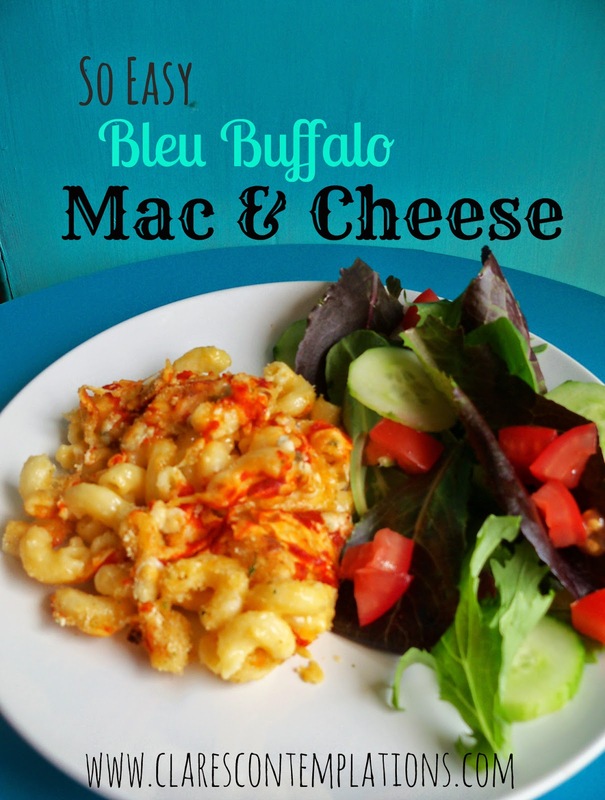 You can also switch things up by adding peanut butter, or protein powder. I also find that smoothies are a great way to use up leftover fruit salad-that usually isn't appetizing to look at, but throw it in a smoothie and you won't even know! So, hopefully this will help you to avoid some of the mistakes that I made. Smoothies are really one of the best breakfast foods ever-protein, fruit, some veggies, and all those omegas, minerals and vitamins for around 300 calories? Yes, please! If you have any great smoothie tips-especially for those of us without $200 blenders, please share!